Camping near Park City is something we do most every year. We enjoy the cooler temps, the water sports, mountain biking, and golf opportunities there. It’s also only a 5 hour drive, so we feel like we’re really getting away from everything without spending an entire day on the road. When choosing a campground nearby, we’ve visited and stayed at more than one and finally settled on our favorite: Jordanelle Reservoir and State Park. Right off of Hwy 40, between Heber and Kimball Junction, Jordanelle Reservoir is filled by the Provo River and has three recreation areas: Ross Creek, Rock Cliff, and Hailstone. Because Hailstone is where the campground is, it’s what we’ll focus on for this post. There are multiple RV camping loops with tent pads, and there is also a huge dedicated tent camping area as well. The RV sites have water and electric hookups and most have at least a few trees and scrub oak to provide some privacy and shade. Depending on your site location, you might have views of Deer Valley Ski Resort (beautiful this time of year as the leaves change!) or the reservoir itself. Site sizes vary, so make sure that you read carefully about the site you’re choosing. The rules here specify that all wheels of your RV and cars must be on the driveway/pavement area of your site, so it’s best to double check and make sure everything will fit before arriving! Most sites are large enough for fifth wheels and larger motorhomes and there are many pull-throughs to choose from too. Every loop also has easy access to free hot showers, which is great if you’re trying to save space in your gray water tank! While you’re here, you have easy access to the boat launch and marina. There are rental options for many types of watercraft, including boats, jet skis, kayaks and paddleboards, and they’re really affordable! If you bring your own boat, make sure, that if you’ve been to Lake Powell, you check in with the rangers to have your boat inspected for quagga mussels. We love the easy access Jordanelle gives us to hiking trails in Kimball Junction and Park City. Within 15 minutes we can be parked at Park City Ski Resort for a hike or bike ride there, and we can follow it up with a microbrew from Wasatch Brewery or Squatters right in downtown Park City. If golf is a sport you enjoy, you’re only 15 minutes from the 2 available courses at Wasatch Mountain State Park in Midway, or the 2 courses at Mountain Dell, a public golf course off of I-80 between Park City and Salt Lake. 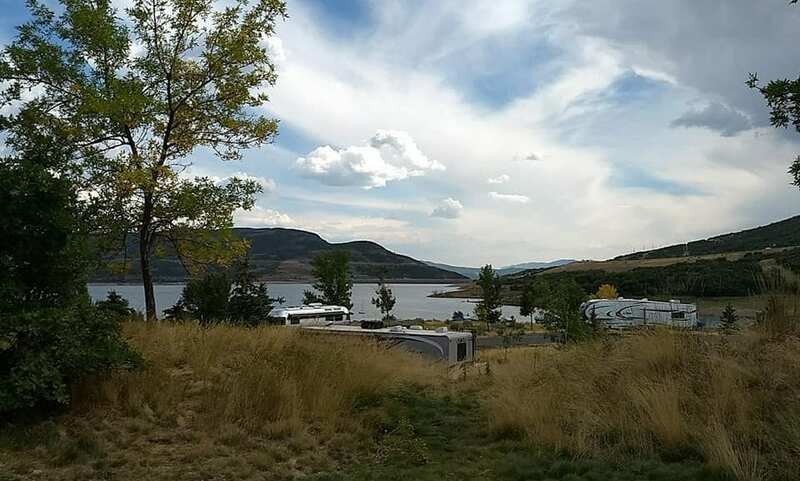 There is SO much to do here, and Jordanelle Reservoir makes it convenient and pleasant to camp and play! *all opinions here are our own; this is not a sponsored post.